This is the second time this week that I tossed an egg with pasta, so I thought I'd share. 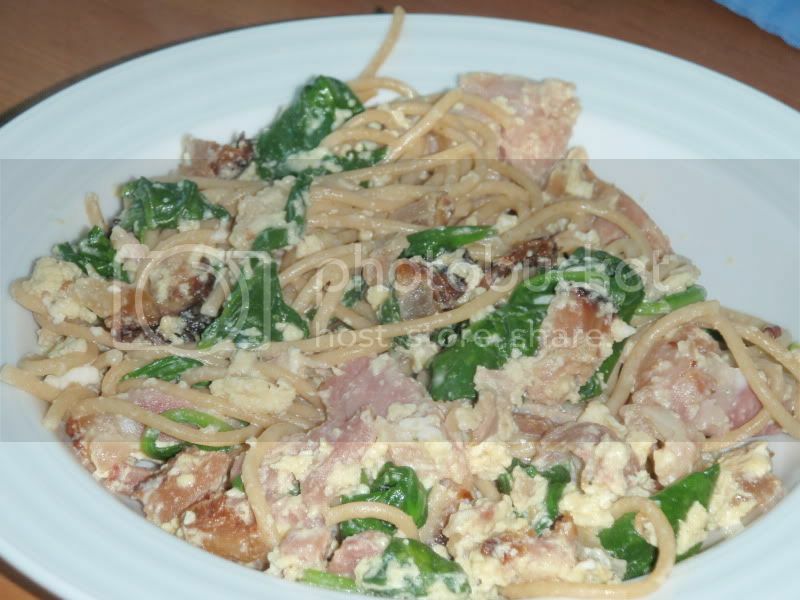 I know that an egg goes in carbonara sauce, but I don't know what all else. My method is just a quick way to use leftovers out of the fridge using the egg as a binder. In a medium non-strick skillet, saute the ham to take the chill off and brown it a little. Meanwhile, cook/reheat the spinach and pasta in the microwave for 1-2 minutes covered with a wet paper towel. In a small bowl, beat together the egg, cheese, milk, and a sprinkle of salt and pepper. In the skillet, toss everything together with the ham. Cook for about 3 minutes, tossing the mixture with tongs or stirring with a spoon, until the egg is cooked.